EPA administrator Scott Pruitt's vision for the agency is being challenged in the courts. Pruitt is leading the Trump administration's efforts to dismantle the agency he was tapped to lead. This is a reflection of Trump's agenda and a longstanding Republican goal. Although his mandate concerns the health of Americans, Pruitt has demonstrated that he is guided by an agenda that advocates for polluters. A.court-ordered release of Pruitt's emails reveal that he is a stalwart advocate for the fossil fuels industry who has no interest in science. Trump put the Fox in the Henhouse when he named Pruitt to head the EPA. Shortly after assuming his role as administrator Pruitt's intentions became clear as he began targeting environmental protections and climate action including the Clean Power Plan. However, groups like the NRDC are successfully challenging this administration and the GOP in courtrooms across the country. It is ironic that prior to taking over the EPA Pruitt repeatedly used the courts to try to kill the government's environmental protections, now the courts are protecting the agency. In June 2017 Pruitt announced that he would stay enforcement of methane leaks called "fugitive emissions". In response to a lawsuit, the Court of Appeals for the Washington, D.C., Circuit ordered the EPA to lift its stay on the methane rule. The federal court prevented Pruitt from extending the suspension of the methane pollution rule from 90 days to two years calling the Trump administration’s actions "arbitrary, capricious, and "in excess of statutory authority". The ruling ordered the full implementation of the rule without further delay. The ruling came on July 3, 2017, when the U.S. Court of Appeals for the District of Columbia Circuit struck down the extension of the suspension in a 2-1 decision. According to the District Court for the Northern District of California, Trump’s Interior Department "misused a provision of the Administrative Procedure Act when it stalled key provisions of a rule aimed at reducing methane venting and flaring on public and tribal lands." The decision indicated that the Trump administration acted unlawfully when implementing the order. 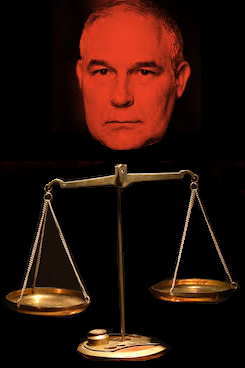 Pruitt has also been forced to back off a decision to stay a 2015 regulation on ozone after sixteen states sued the EPA. Court challenges brought by environmental groups or states are pending on several other stays, and seventeen states have filed suits over his intention to rescind the Clean Power Plan.